According to the Centers for Disease Control (CDC), about 1 in 5 children aged 6-19 years old is obese¹. This means that they have excess body fat, putting their body mass index (BMI) scores above the 95th percentile. While there are a number of factors that may contribute to these statistics, the reality is that children struggling with being overweight or obese are prone to physical, social-emotional, and future health problems. Research has found that children with autism are at or above the same risk of becoming overweight or obese. Variables specific to autism spectrum disorder include disordered sleep patterns, motor planning difficulties, possible genetic variations, medication side effects, dietary restrictions (preferences, limitations), and commonly using food as a reinforcer for some programming. Given that the risks are higher for weight-related issues in children with ASD, it is even more important that exercise be incorporated as part of their daily routines. However, because each individual’s sensorimotor planning, coordination, and language skills are unique, exercise habits are necessary to directly teach, model, and reinforce regularly. Sensory-minded therapists and pediatricians talk about engaging your child in active play for motor development, strength, and coordination. Certainly your child or teen with autism actively engages in active sensory play—jumping, crashing, swinging, climbing, spinning—but does it rise to the level of exercise? The American Academy of Pediatrics recommends 60 minutes of “activity” per day such as biking, bowling, dog walking, or team sports5. But what exactly qualifies activity as exercise? It’s never an easy feat for parents to sort through the terminology professionals use to describe essentially the same thing: moving to learn, moving to grow, moving to stay healthy! Whatever you call it, promoting an active lifestyle for your child and family will bring shared memories, skill development, and health benefits for years to come. 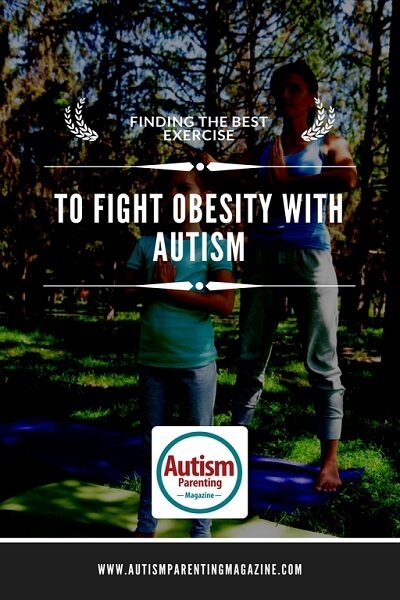 The general population likely exercises for reasons related to overall health, weight management, or to “clear the mind” of daily stressors, but many of us don’t look beyond our own rationale to the additional benefits of exercise for people with autism. Exercise promotes the natural release of endorphins that assist with parasympathetic nervous system functions such as self-regulation and sleep management, both problem areas of people with autism spectrum disorder. Much like a sensory diet is designed to target parasympathetic functions, exercise brings about similar physiological responses. Changes in heart rate, breathing, and blood pressure are noted following just 30 minutes of aerobic exercise. In a meta-analysis of research on the benefits of exercise, Sowa et. al., found that physical exercise improved the motor skills and social skills of children and adults with autism6. Another systematic review of research on the topic found that decreases in stereotypy, aggression, off-task behavior, and elopement were reported, while increases in on-task behavior, appropriate motor behavior, and academic responses increased following physical exercise7. When looking at how to incorporate exercise into one’s daily routines, it is important to approach tasks with your child’s abilities and interests in mind. If your child is aversive to catching a ball, perhaps hold off on basketball as the activity to target exercise! Work with your child’s clinicians and teachers to find a just-right motor challenge or shape an existing skill into something more. All of the activities below are mentioned because they can be modified or adapted in some way to meet your child’s needs. Exercise is possible regardless of one’s ability level! With visual supports like cones and cue cards, modified materials like using bean bags for tossing versus tennis balls for throwing, and partner-assisted skill building, it’s possible to backward chain harder skills to set kids up for success each step of the way. For some children and families, exercise plans are included as part of the Individualized Education Plan (IEP). This can define the expectation for an active approach to learning and dictates that movement be incorporated regularly into the school day above and beyond the typical recess and gym schedules. Not all families or educational teams feel this is necessary, however, it is an available option to plan for exercise within an IEP. Some school-based physical therapists, occupational therapists, and adaptive physical education teachers have found support using Exercise Buddy, a cross-platform app program which was designed to support fitness and behavior in people with autism. Exercise has benefits for the general population as well as those with ASD. Incorporating, directly teaching, and planning for exercise to be part of a typical day will support your child’s social, motor, regulation, and behavioral skills. There is an opportunity, regardless of ability level, for all children to find an activity suited for exercise so get out, get moving, and let us know what works for your child! “Healthy Schools.” Centers for Disease Control and Prevention. Centers for Disease Control and Prevention, 25 Jan. 2017. Web. 08 Sept. 2017. Curtin C, Bandini LG, Perrin E, Tybor DJ, Must A. Prevalence of overweight in children and adolescents with attention deficit hyperactivity disorder and autism spectrum disorders: a chart review. BMC Pediatr. 2005; 5: 48. Curtin, Carol, Sarah E. Anderson, Aviva Must, and Linda Bandini. “The Prevalence of Obesity in Children with Autism: A Secondary Data Analysis Using Nationally Representative Data from the National Survey of Children’s Health.” (n.d.): n. pag. BMC Pediatrics. BioMed Central, 23 Feb. 2010. Web. 08 Sept. 2017. Curtin, Carol, Mirjana Jojic, and Linda G. Bandini. “Obesity in Children with Autism Spectrum Disorders.” (n.d.): n. pag. Harvard Review of Psychiatry. U.S. National Library of Medicine, 2014. Web. 08 Sept. 2017. “AAP-Updates-Recommendations-on-Obesity-Prevention-It’s-Never-Too-Early-to-Begin-Living-a-Healthy-Lifestyle.” Site Title. N.p., n.d. Web. 11 Sept. 2017. “Effects of Physical Exercise on Autism Spectrum Disorders: A Meta-analysis.” (n.d.): n. pag.Effects of Physical Exercise on Autism Spectrum Disorders: A Meta-analysis – ScienceDirect. Web. 12 Sept. 2017. “Physical Exercise and Individuals with Autism Spectrum Disorders: A Systematic Review.” (n.d.): n. pag. Physical Exercise and Individuals with Autism Spectrum Disorders: A Systematic Review – ScienceDirect. Web. 12 Sept. 2017. Physical Exercise and Autism | Autism Research Institute. N.p., n.d. Web. 12 Sept. 2017. “Why Active Play Is So Important | CBC Parents.” CBCnews. CBC/Radio Canada, 09 Mar. 2017. Web. 11 Sept. 2017. This is fine and good, for “children”. What if a child was NOT diagnosed with autism (ASD) at a youthful age. When diagnosed as an (older) adult, it is not so simple… This article doesn’t seem to address all the medical co-morbidities that occur with individuals on the spectrum. Yes, this article does speak to adjusting exercise to motor skill abilities, but what about pre-existing issues regarding digestion and how the body does or does not utilize the nutrients consumed by the individual. Once again, it is professionals and parents who “think” what should be done to combat obesity, etc. We have more stressors in our lives that trigger how our bodies process the foods, especially fats & carbs, and creates fat deposits deep within the abdominal cavity that are not so easily eliminated via exercise. Once again, Autism is a “Spectrum” disorder. No two of us can have our health concerns addressed in the same way, or to generalize your recommendations. It’s a much more complicated process than expressed in this article. The kids become adults. Even with the best of intentions and guidance as a child, autism becomes an entirely different beast when these children grow up. Placing all research money into the “kids” is not effective. You need to understand what happens to a person’s body (with ASD) after their 1st 15-17 years of life, which becomes a whole new can of worms.